Miller Electric Mfg. LLC has introduced ZoneFlow technology to the SWX-ZF weld fume extractor, featuring a capture zone that’s over three times larger than traditional systems. An expanded capture zone plays a critical role in an overall cleaner facility, leading to less maintenance and cleaner air throughout the workplace, while also reducing arm interactions for improved productivity. The SWX-ZF weld fume extractor now has a capture distance that’s up to 5 feet deep and 4 feet wide — versus the traditional 12 to 18 inches. 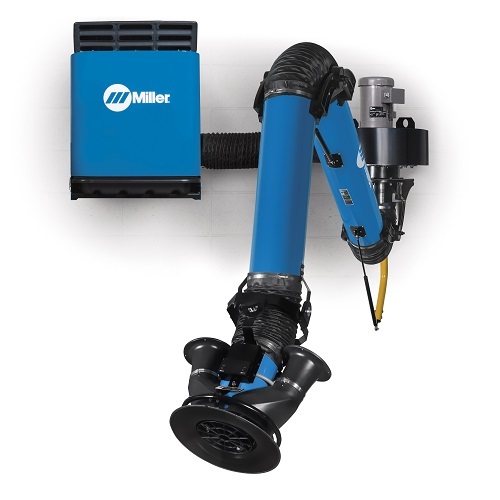 Instead of having to constantly adjust the arm to be close to the source — or worse, not adjust it and be exposed to fumes — operators can continue welding, improve productivity and stay protected. How does it work? ZoneFlow technology moves clean air out of the arm at approximately a 90-degree angle, creating a large negative pressure zone or curtain that extends the capture distance and funnels weld fume particulate toward the center of the arm to be captured. Previously only available on the FILTAIR® Capture 5 fume extraction system, ZoneFlow technology has been expanded to the FILTAIR SWX-ZF stationary wall- or column-mounted system and is available in a disposable cleaning filter model.